This activity actually aided in concept development – it showed that people were willing to throw out words and ideas, and that people definitely had a thought process behind their flow of words. But I digress; back to the subject of confrontation. In this game, confrontation is indirect. The players are competing against each other in order to appeal to both a judge and their competitors. In fact, the majority of interaction with their peers is in order to appease them – which adds a very interesting element to the game competitively. This draws direct inspiration from a lot of the games from the Jackbox series of games (available on Steam) as they are primarily party games focused on being entertaining to both the players and the audience. Jackbox works through both the base game, displayed on a TV or streamed through a streaming service such as Twitch, allows players to join the games through their website on their device of choice to participate. 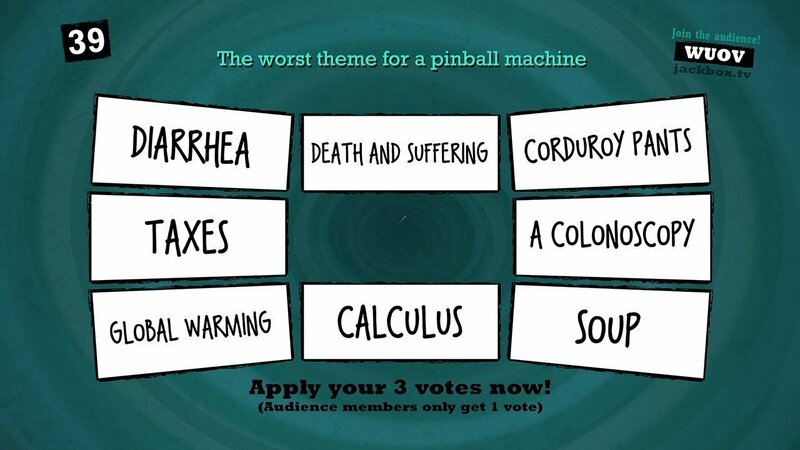 Quiplash, in particular, has players come up with witty responses to a series of pre-determined scenarios. The game then takes these answers and displays them for all to see, and the other players who did not take part in answering that particular question vote on their favourites. Final round of Quiplash, from Jackbox games. Choosing to add this element to my game, I believe, takes away from the stress part of competition, especially as there are those who strategise their winning by appealing directly to the judge (at least, that’s how all of our games of Cards Against Humanity ended up being after a few rounds). The focus is now to be creative, witty, and create unexpected or hilariously practical answers.